The SE is genuinely a knockout guitar. Even the most cloth-eared punter would agree this sounds a cut above budget strumboxes. PRS-looks, sound and playability. Build quality. Lacks a little presence. Picking sounds. 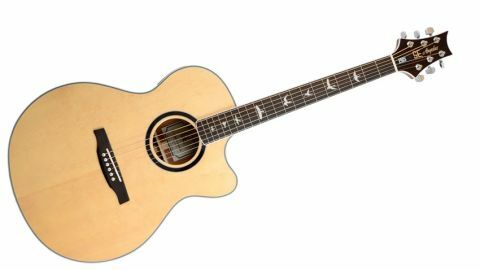 Right about now, we can feel your cynicism burning through the page: 700 quid for an acoustic guitar in the middle of a recession? We hear you, friend, but this is no everyday log. The PRS SE Angelus (Latin for 'angel') doesn't just look heaven-sent, with a body like honey on toast, but it's also a slam-dunker on the spec sheet. Most serious strummers have a solid top, but this model matches the Sitka spruce soundboard with a solid mahogany back for a tone that should bed in and keep improving. Frustratingly, you can't quite call it all-solid, because the sides are laminate, but it hardly feels like a model befitting the utilitarian 'Standard' designation. "Inside, you'll spot PRS's signature fusion of X and classical bracing transplanted from the US acoustic range"
Inspect the goods and, barring a bit of cosmetic staining on the binding and minor glue smears, the Korean branch has done a tidy job. Inside, you'll spot PRS's signature fusion of X and classical bracing transplanted from the US acoustic range, alongside touches including the iconic bird inlays, which flap up the fretboard to that traditional headstock, and momentarily fool you into thinking it's a real PRS (which it should be, probably, for £699). With a tighter-pinched waist than a dreadnought, hopes are raised that the Angelus will be a good physical fit - and so it proves. It's not so much the neck, although that's certainly a cracker: it's not too skinny, and with a good wide profile that welcomes fingerstyle. It's more the relatively svelte body (about 110mm/4.33 inches deep at the bottom strap pin) and compact soundboard, which clocks circa 390mm (15.35 inches) at its widest point. Best of all is that cutaway, which gives comfortable access to the higher frets. "When you really dig your fingers in, this model reacts with the kind of snap 'n' pop that "
There are a million spruce/ mahogany guitars out there, but this one just sounds a little different. From the moment you roll a fleshy thumb over an open chord, you'll appreciate the warmth and rounded mids, and when you really dig your fingers in, this model reacts with an characterful snap 'n' pop. It's the kind of tone you'll want to mic up and run unadulterated through an acoustic amplifier, especially because, raw, we felt it lacked a little bit of presence and welly. It's also a little less convincing with a pick, where the gulf between this and the massed ranks of cheaper guitars out there closes a little. These are minor criticisms, though.